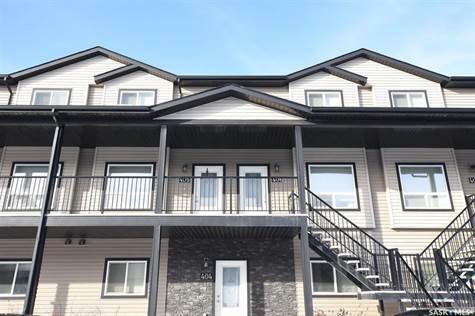 Watch your child or grandchildren enjoy the play structure while sitting on your front balcony when you own this fantastic opportunity in this well maintained townhouse style condo in east Regina! You may qualify for the Mortgage Assistance Program unique to these condominiums. Walk into the front entry to a very inviting living space with good space to entertain and a fireplace! Updated vinyl plank flooring on the main floor. The kitchen is done in espresso cupboards and boasts stainless, steel appliances, plus granite countertops! Storage, mechanical and a 2pc bathroom complete the main floor. The second floor has two bedrooms, one with a walk-in closet and a 4 pc bathroom plus 2nd floor laundry. Enjoy the front view of the children playing on the structure south and below or head out the dining room garden door to the balcony for the peaceful prairie view. So many choices on how to enjoy fresh air and an affordable condo lifestyle! Pets allowed with restrictions. 6 appliances and 1 parking stall included in purchase! Close to all east amenities.